The smiling faces remind us that happiness is a skill and contagious when shared with other people. Our two happy people represent good communication, meaningful relationships, and closeness of family and friends. Copper, a conductor and balancer of energy, aligns body and mind. Hematite symbolizes a reduction of stress while increasing health and energy. Mother of pearl depicts warmth, nurturing, and understanding. The green beads, with brown swirls, represent a generous mix of abundance. Amber; harmonious encounters with other people. The rose: opening up to love and friendship. All items in threes, (3 finger beads) convey health, wealth, and happiness to the person wearing the bracelet. Every cell in our body has a memory which corresponds to the way we think. Each bead counsels us to think uplifting happy thoughts. The shell emphasizes easy adaptation to new experiences. Hearts stimulate unconditional love. The crystal disks are wheels of good fortune and blessings. The rose opens the door to love and friendship. The fish represents a generous abundance of good and circulation of wealth. Turquoise revives body balance and promotes mental relaxation. Rose quartz brings self assuredness. The five points of the star guide us to invest in our life with prayer, meditation, study, service and circulation. Three white beauty Braille beads show us beauty and happiness flowing into every area of our life. All items in threes convey health, wealth, and happiness to the person wearing the bracelet. Every bracelet is hand crafted using the finest materials. 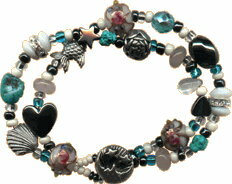 They are lovingly assembled with glass beads and stones gathered from all over the world. The color amber conveys peace and harmony while activating a person's true altruistic nature. The tear shaped, black and gray "snowflake" stones guard against emotional draining and unwanted vibrations. The black hematite heart increases strength and energy. The sun; radiant happiness. The fish; abundance. Gold dust beads; good fortune and golden opportunities. All items in threes, (three amber & black beads), convey health, wealth, and happiness to the person wearing the bracelet.